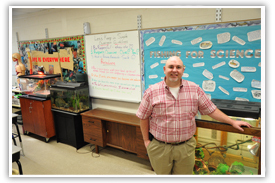 John Griffin's (‘94) biology classroom at South Side High School in Jackson is like many classrooms covered in colorful education posters and charts and is accented with reptile habitats and fish tanks. 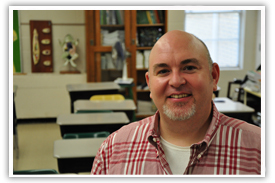 A friendly guy who like most high school teachers has learned to take things in stride, he chuckles as a student with a light cut pops in asking for super glue instead of a Band-Aid. Griffin was a geology graduate with a minor in biology when he crossed the UT Martin stage on graduation day, prepared on paper but unsure about his future. He cranked out applications to graduate schools, and in the process also cranked out an application to a different institution that would guide him for the rest of his life—the Peace Corps. “In the process of applying for graduate school I also applied for the Peace Corps and just happened to be accepted,” Griffin said. The Peace Corps, they call it "the toughest job you'll ever love." It's a roughly two-year commitment serving in a foreign country, and takes the average American to places they would otherwise hardly know existed, but it's also a priceless investment in education and personal growth, Griffin says. “Once you’re accepted, once you’ve gone through the process, then they start trying to match you up with a job that meets your needs, and they offered me Peace Corps Poland at the time,” Griffin said. At the age of 23 Griffin went to serve 27 months in Poland where he was assigned a position working in environmental consulting. He went through training his first three months and lived with a Polish host family that spoke no English. Because of the drastic cultural immersion he learned the Polish language fluently by the time he went to work for a non-governmental organization in a Polish city of about 50,000. One of those environmental needs was working to integrate the wastewater treatment facility, solid waste management and the power facility in the area, all three of which had been operating as separate entities. “I worked to try to integrate them all together so that one helped another,” he said. Culturally, Griffin’s role in Poland was also to set a “Westerner” example, as Poland had only a few years prior to his visit, come out from under communist reign. “The Peace Corps has a three-prong process. One is to provide a service to another country. Two is to educate people in another country about Americans. And then the third and probably most important is to come back to America and educate people here about different cultures and different societies,” Griffin said. It was tough, he confessed, echoing the Peace Corps motto, and the application/interview process a bit lengthy, but more than worth it. For one, though it is a volunteer program, housing and living expenses are covered during the entirety of one’s service. Two, it just might not only open doors of opportunity but knock down entire walls. At least it did for Griffin who stayed in Poland for two years after his service was complete working as a Peace Corps trainer, translator and continuing his environmental work. Coming back to the United States from the country where peasants live two miles outside of major cities, was a reverse culture shock but worked out in the classroom.